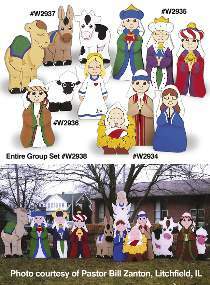 These are the same figures as in our #W2589 Tabletop Children's Nativity but enlarged to make an outdoor display for your yard or for your church. You can order individual plan sets for example just the Jesus, Mary & Joseph or just the Three Kings or save even more on the complete 12 piece set. All projects are drawn FULL SIZE on large pattern sheets. Make them from 1/2" plywood. People measure 30" to 33" high. Animals measure 18" to 33" high. To display figures on your lawn, order our #8565 Yard Ornament Mounting Kits which contain two 3/8" diameter x 18" long fiberglass rods with four steel clamps and mounting screws. The fiberglass dowels slip into the ground easily and can be removed after Christmas even if the ground is frozen. Order one kit for each figure. NOTE: Order 10 or more kits at a discounted price per kit. The #W2938 Yard-Size Children's Nativity Scene Special includes all four plans pictured.